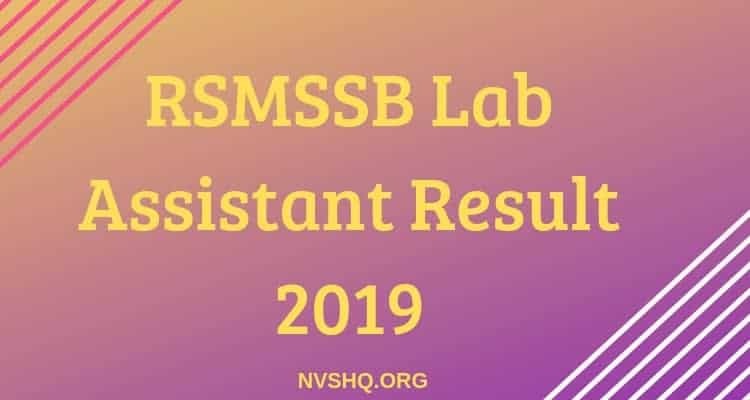 RSMSSB Lab Assistant Result 2019 Merit List: RSMSSB Lab Assistant recruitment exam result 2019 is expected to release soon in the month of April/ May 2019. Result be published on the official website of the commission. Candidates have to access their result by using their SSO Id and password. In order to get more information related to Rajasthan Lab Assistant examination result, readers have to go through the article shared below. 2 How to check RSMSSB Lab Asst. result/ merit list? Selection Board has recently announced the answer keys and the final answer key will be announced soon. Those who have appeared in the exam and haven’t checked the answer key yet can view it. Answer key is available on Board’s portal. On the basis of the objection, board will release the final answer keys. Once the final answer key will be published, Board will also publish the result few days. RSMSSB result for Lab Assistant result is supposed to be announced in the month of April/ May 2019. Result and merit list will be published on official website. No printed result will be sent to any candidate individually through post. They can access it only from the official website with the help of login credentials. However, they can also view it by clicking on the direct link shared on this page. How to check RSMSSB Lab Asst. result/ merit list? Go to the official website i.e. http://www.rsmssb.rajasthan.gov.in. Select “Download result of Direct Recruitment of Lab Assistant exam 2018”. Enter the SSO ID/ Username and password. Also, enter the captcha code and click on login button. Lastly, download the result and take a print for references in future. Lab Assistant result will indicate the result of the candidates appearing in the written examination. All the details that will be printed on the result sheet will include- Name of the candidate, roll number, SSO ID, admit card no., date of birth, exam date, post & its code, gender, category, marks obtained by the candidate, total/ maximum marks, result status, remark (if any) and important instructions related to the further selection proceeding. The detailed notification about further selection procedure will be announced separately on the official website after the release of result. Cut-off marks plays an important role in Lab Assistant recruitment exam. Candidates need a minimum number of marks to be eligible to qualify the exam and to get their names in the merit list. The cut-off marks for all the categories is different and candidates should score marks equal or more than the cut-off marks to get selected in the merit list. Candidates marks should be more than the cut-off marks set for their category. In case of any query related to this article, candidates are free to share their queries with us. They can mention their issues in the comment section below. please send me information this regarding . on my gmail id. Anne hi vala h. Wait kariye.